Thanks to the internet, working from home is a trend that has become quite popular in recent years and is still gaining popularity. 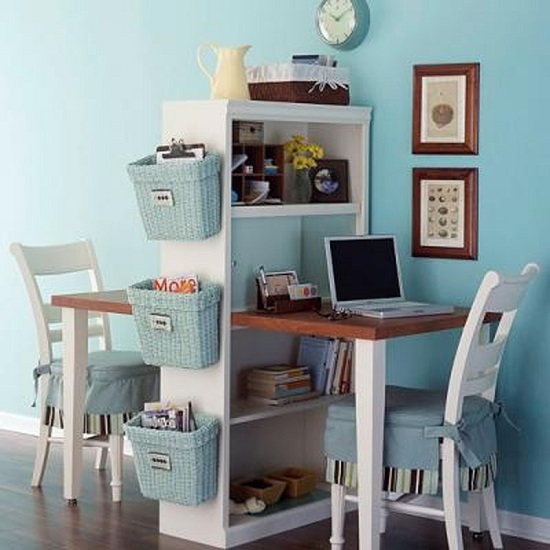 A properly organized work space will help you maintain your focus and get work done from home. Creating a perfect home office that caters to all your needs and also compliments the décor of your room can be quite a tricky task. 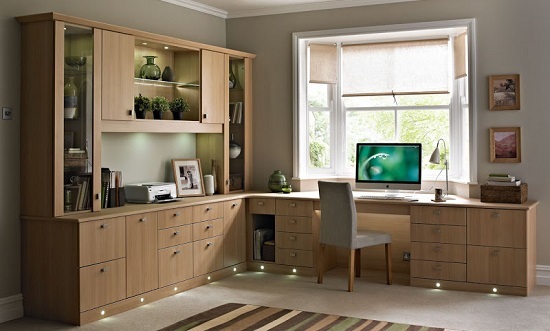 A home office requires a space that is dedicated to work only and can make you feel professional and productive. This space needn’t be a separate room, it could simply be an area that is well divided and set up of work. With Home Office Design Ideas, this is completely possible. Working all day long or even for some hours every day requires a comfortable space that allows for things to get done as efficiently as possible. Here are 15 Home Office Ideas that will allow you to design the perfect home office for yourself. Use modern artwork and neutral colors for your home office. This gives a more professional look and does not steal too much focus from the rest of the room. This means, it doesn’t really stand out. With a small desk and wall hangings, it feels complete. If you live in an apartment, you would experience the problem of scarcity of space. This is one of the most effective Home Office Ideas for people living in apartments. Convert your closet into to a streamlined work station. Such Home Office Designs look chic and stylish. With floating shelves and a covered area, this office also solves the purpose of storage. 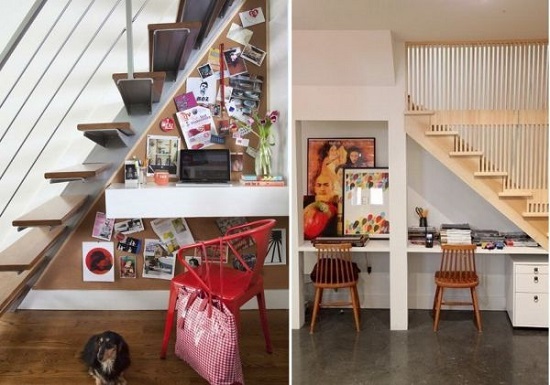 You can transform the tiny space beneath the stairs into a tidy work station. Generally, this space remains unused or is used to put away clutter. 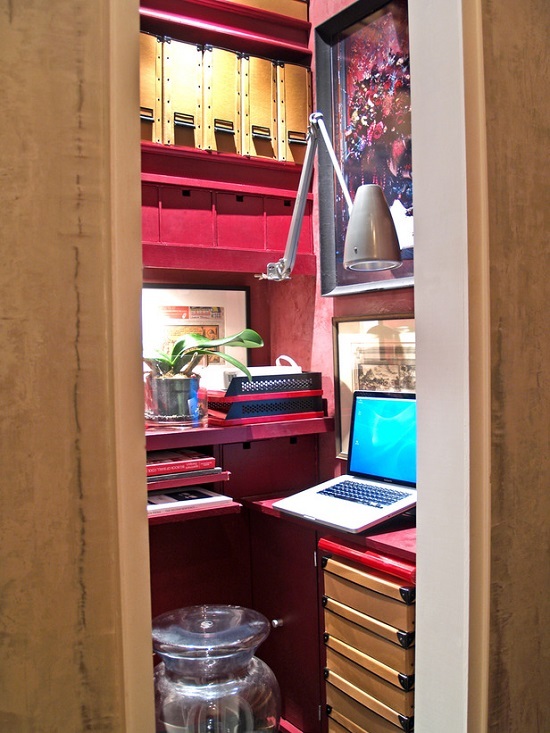 This Home Office Design allows you to make the best of an unused space. A cork board on the back wall along with a floating shelf is all you need to add. Storage space can be provided under the floating desk. If you work with a partner, you would need to design an office accordingly. Make sure that the furniture and storage space looks professional. 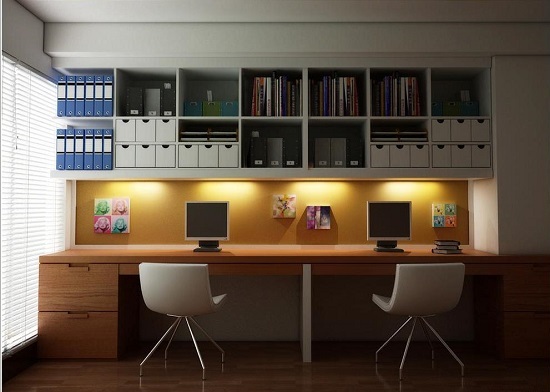 This home office is designed keeping the needs of those people in mind who have a lot of paperwork. They design is simple but appealing. The green plants add energy and warmth. The black and white combination never goes out of fashion. It looks professional and extremely modern. You can add pictures to get the personal touch. Borrowing space by adding a short wall or partitioning is a great idea. 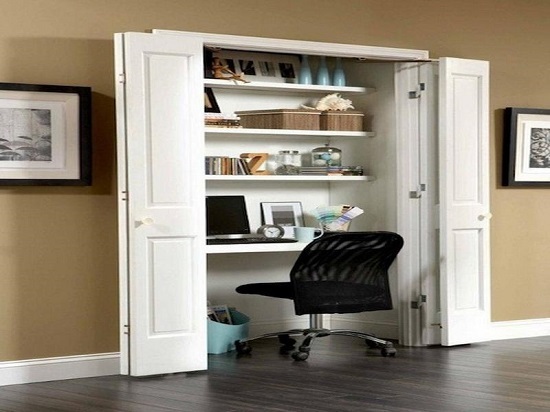 This is ideal for compact spaces and custom built home Office Furniture helps define the space. Add color and multiple storage spots to give the space character and warmth. 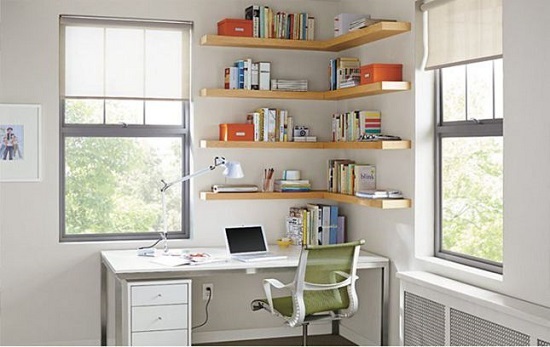 While looking for space for home offices, you mustn’t overlook the corners. 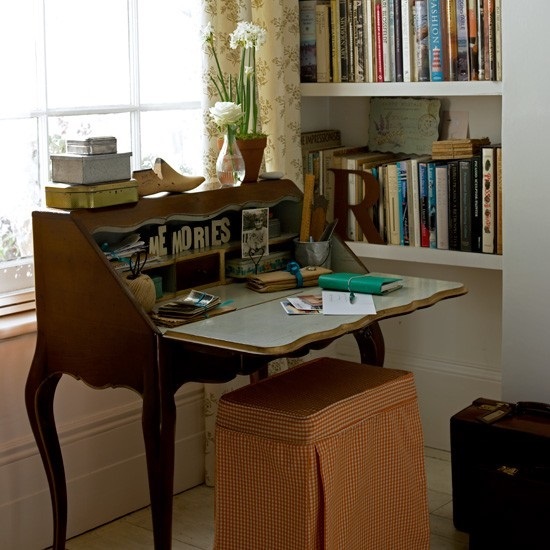 A corner desk efficiently hides the work space and makes it blend into the room without standing out. A small traditional desk can be turned into a work station. They key is to showcase only the essential items in a creative and appealing manner so that it doesn’t look boring. The great thing about home offices is that you can design it according to your taste. Don’t be afraid to experiment with colors. Make it bright and chic. This is a home office area for a couple. It looks wonderful with a neat and brightly colored open storage space. Just tuck away the laptops and paper work and the table serves as a dining table. You need ti stay energized in order to keep working. One way to do this is to decorate the walls of your home office in a creative manner. The trick is to keep it bright and lively with shades of green, yellow, pink, orange and other such colors. This is the best utilization of whatever little space you have. Custom built-ins and surfaces that can be rolled out or stowed away do the trick here. If you love working with your better half, go for the cute couple offices where you can work and bond. White and blue when put together can never go wrong.Go for furniture that fit into the decor of the room and gives warmth. Pick up a vintage table, pair it up with a chair and traditional baskets for storage and decorate it with photo frames, a lamp or flowers and your work space is ready. This looks best in front of a window in the bedroom. This way, you get ample natural light and an overlooked space is transformed into a beautiful work space. This design is perfect for those who have an artistic inclination. A white background works very well with this design. Add posters, pictures, plants and a comfortable wooden chair. Adding a nice carpet is also a good idea. These were just a few ideas to inspire you to put on your creative hats and create the perfect office at home. 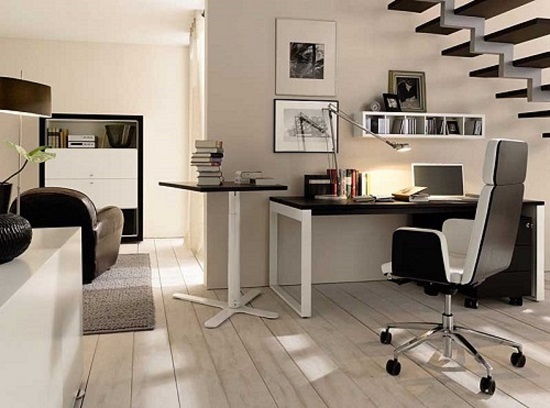 Home Office Designs don’t necessarily need a lot of space but they surely need a lot of creativity and innovation. When it comes to designing our home office, we really need to be careful and creative as it should actually look like a office where we can work peacefully without actually disturbing the personal interiors of our house. All the above mentioned are actually great ideas. I loved the black and white one, Thanks for this great post buddy..! !